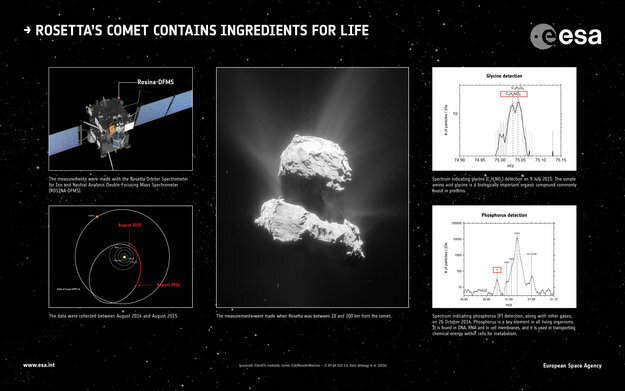 May 30, 2016 – Ingredients regarded as crucial for the origin of life on Earth have been discovered at the comet that ESA’s Rosetta spacecraft has been probing for almost two years. They include the amino acid glycine, which is commonly found in proteins, and phosphorus, a key component of DNA and cell membranes. 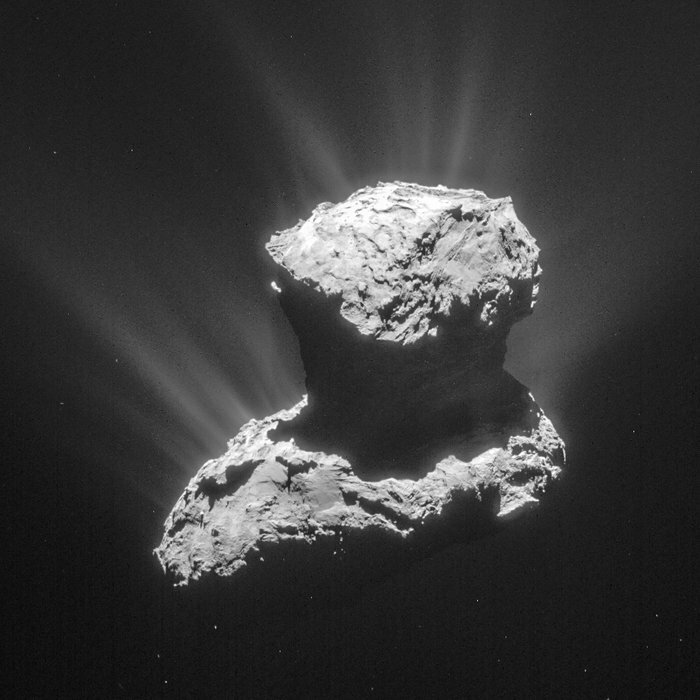 While some comets and asteroids are already known to have water with a composition like that of Earth’s oceans, Rosetta found a significant difference at its comet – fuelling the debate on their role in the origin of Earth’s water. But new results reveal that comets nevertheless had the potential to deliver ingredients critical to establish life as we know it. “We see a strong link between glycine and dust, suggesting that it is probably released perhaps with other volatiles from the icy mantles of the dust grains once they have warmed up in the coma,” said Altwegg. “Glycine is the only amino acid that is known to be able to form without liquid water, and the fact we see it with the precursor molecules and dust suggests it is formed within interstellar icy dust grains or by the ultraviolet irradiation of ice, before becoming bound up and conserved in the comet for billions of years,” Altwegg said.